As the Vivienne Tam beauty crew set to work on Sunday, there was a flourish of activity outside the tents. Paparazzi scrambled, bystanders gawked, and security guards barked orders as the rarely-under-the-radar Paris and Nicky Hilton left the DVF show. Such chaos made for a comparatively Zen-like state in the usually raucous backstage area. 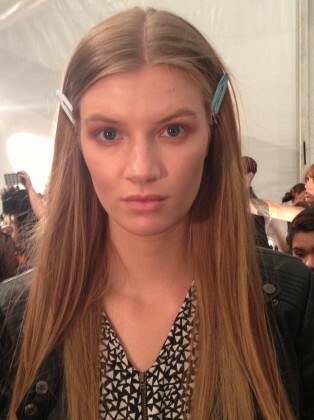 The hair and makeup designs at Vivienne Tam were a perfect match for the chilled-out vibe. Skipping elaborate updos and tricky styling, the TRESemmé team, led by stylist Jeanie Syfu, left hair down and sprayed roots with dry shampoo for a matte effect (imagine that—avoiding shine!). Makeup was equally laid back with bronzed and sculpted cheeks and eyelids, but no mascara or lipstick. While makeup traditionalists will tell you to either do a bold eye or a dramatic lip, the M.A.C artists, led by Maud Laceppe, seemed to eschew convention by doing neither. The result was an easygoing glow that didn’t clash with the prominent prints in Tam’s collection. Plus, skipping out on faux lashes and gobs of mascara? What could be more easygoing than that?